A woman harvests rice by hand in the Ayeyarwady Delta. One of the things I do on every visit to Myanmar is drive into the Ayeyarwady Delta, west south west of Yangon. It's become a marker I use to gauge economic changes. And there have been a lot of changes. My first visit was five years ago. There was one roadside restaurant (by that I mean proper restaurant with service people, tables and chairs, and a building) but many food stalls. My last visit was two years ago and there were a lot of changes. Many more restaurants, many gas stations being built and more traffic. This time the changes were overwhelming. The road ultimately leads to Chaung Tha Beach, about five hours from Yangon and now the road is packed with beach goers. Hotels, more restaurants, and gas stations have sprung up to serve the people going to the beach or exploring the delta. My main reason for going into the delta though is to photograph agriculture. 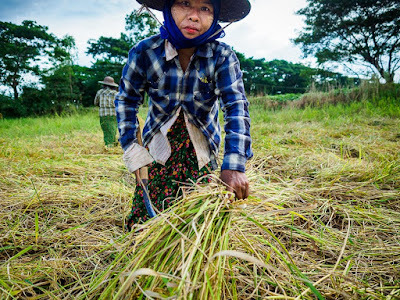 Photographing farmers in Myanmar is like stepping back in time about 150 years, maybe only 100. 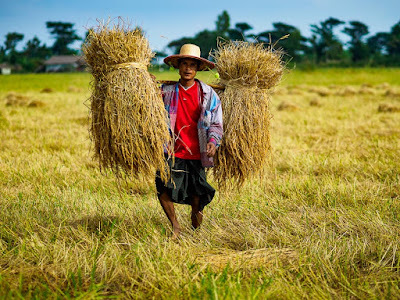 Almost all of the work is still by done by hand, although some tillers and tractors are making inroads and mechanical threshers are becoming more common. 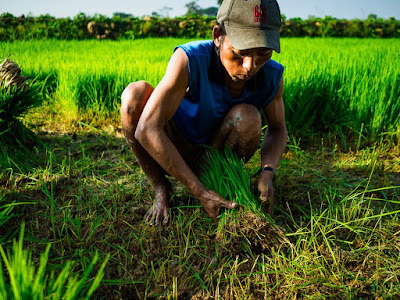 Gathering baby rice plants (top photo) and transplanting them into a paddy (bottom photo). This is markedly different from Thailand where agriculture has been heavily industrialized and most of the rice is harvested mechanically. 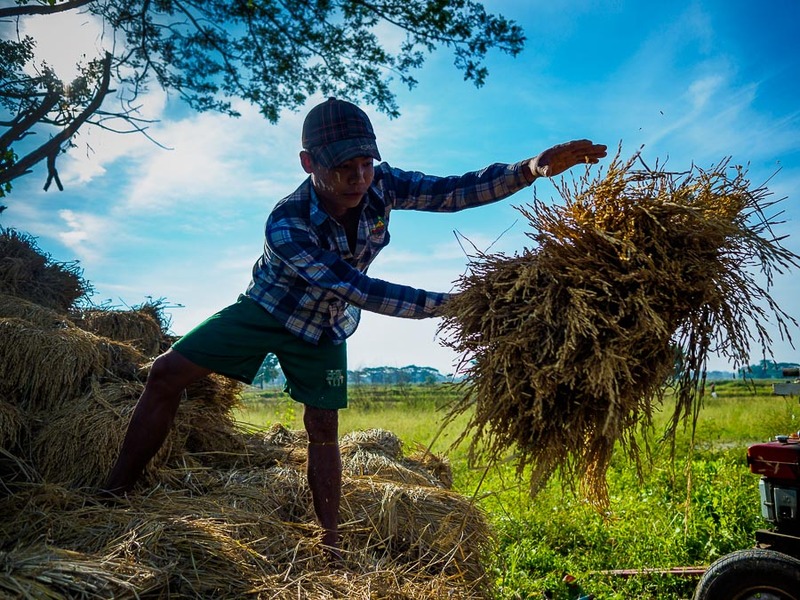 Farm work, whether it's cutting lettuce in Yuma, AZ, or harvesting rice in the Ayeyarwady Delta, is hard, back breaking work. A worker throws harvested rice into a mechanical thresher. Now for a shallow dive into rice geekdom. I like rice. I eat a lot of it. And while I'm not a rice connoisseur, I've eaten enough rice through the years to have formed opinions about it. I can tell when I'm eating Thai rice or Vietnamese or Cambodian or Lao or Burmese rice. Thai rice is always better (I think almost every Thai would agree with me). Sometimes much better. Thai rice (especially "jasmine rice") has better kernels, better aroma when it's steaming and better flavor. 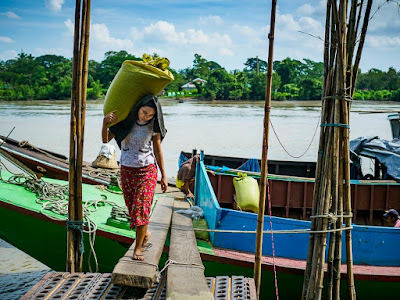 Myanmar was once, generations ago before World War II, the world's leading rice exporter. 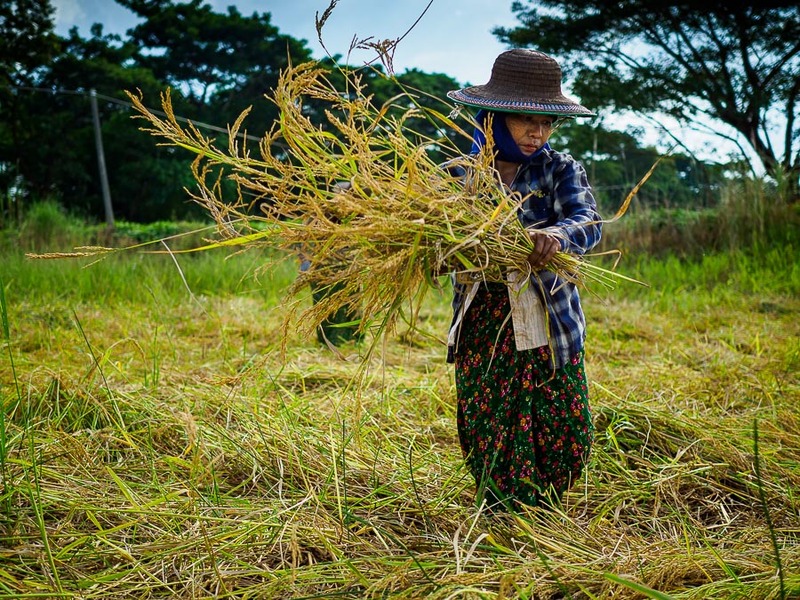 The Burmese rice industry is working hard to improve its international standing and regain some of the export market. 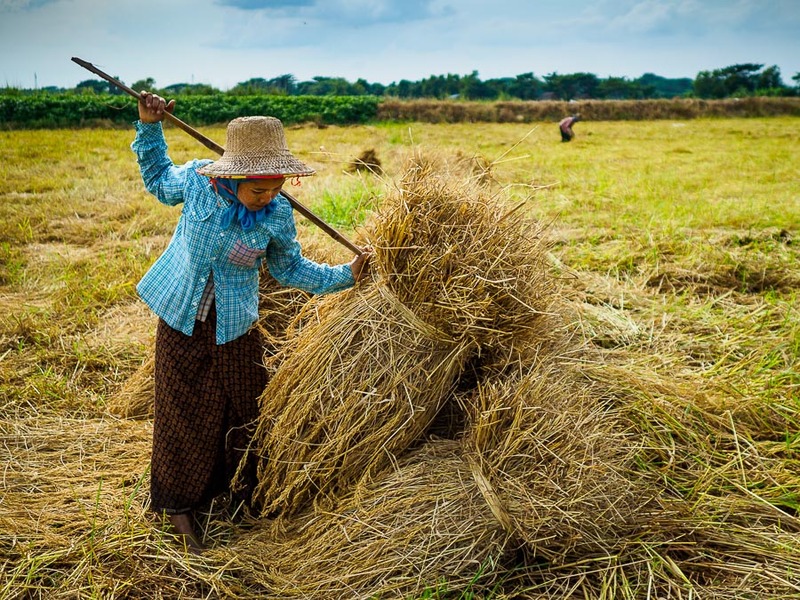 As a result, Myanmar has made huge improvements in its rice crop. The rice I had in the delta this time was a huge improvement over what I had five years ago. Feeding harvested rice into a mill. 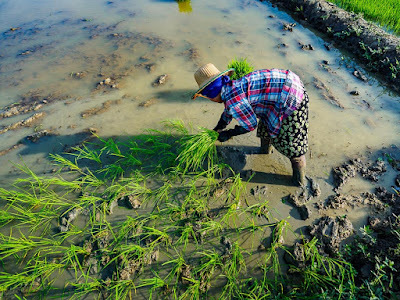 The rice I had in the Delta was more like Indian Basmati rice than regular white rice found in the rest of Southeast Asia. The grains were longer, firmer and didn't clump together the way rice usually does. It also had a nice flavor. A miller in a small town about three hours from Yangon told me the biggest challenge now facing Burmese rice farmers is the lack of infrastructure. His mill, for example, is on the far side of the river from the town he lives in. The local power grid ends at the river bank. He has no access to electricity for the mill. He generates all of his own energy. Power for the mill is generated by burning rice husks. Power for the office is generated by solar collectors. He is literally 200 meters past the end of the line. There are no roads on his side of the river. Rice harvested on his side of the river is taken to the river by bullock cart and floated to the mill on barges. Rice harvested on the other side of the river (the side on the grid) has roads (we got to the town on roads and then took a boat across the river to the mill), rice is brought to the river on trucks and tractors then floated to the mill on barges. All of the rice in the area is harvested by hand. 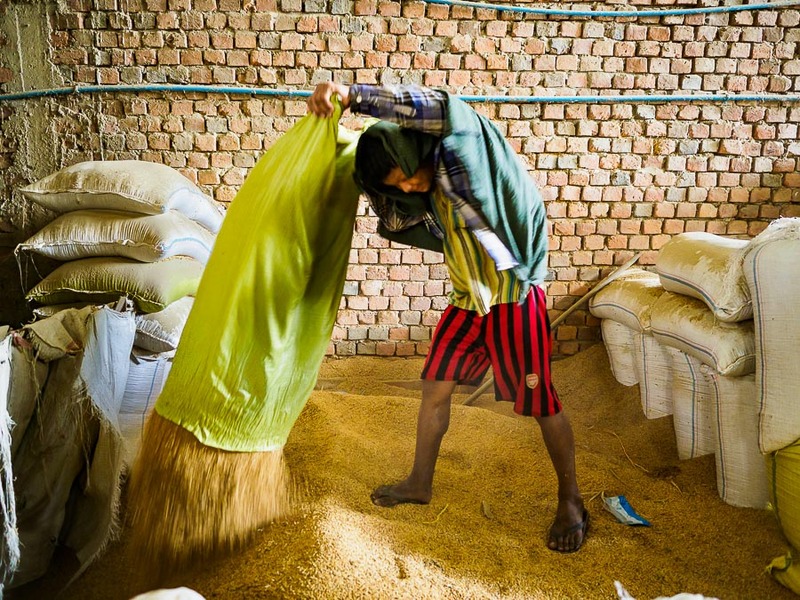 Rice delivered to the mill is offloaded by manual labor. The town, where the electrical grid and highway ends, is on the far side of the river. 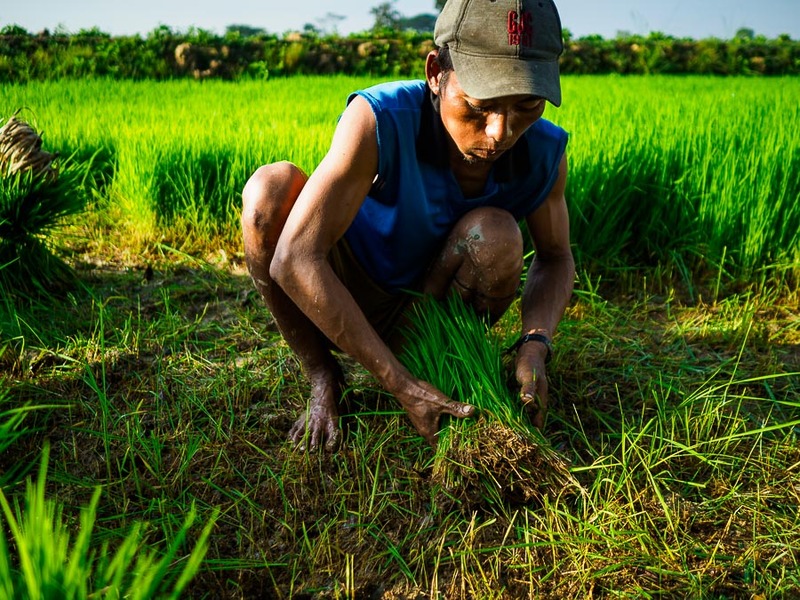 He sees a lot of potential for Burmese rice, but the industry is also facing a lot of challenges. On the side of the river that is on the road system. 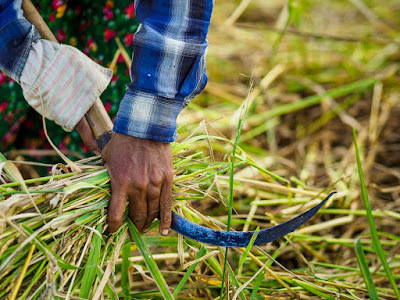 The rice is gathered by hand and stacked in the field. After it is threshed it will be taken to a local mill by truck. There are more photos of the Delta rice harvest in my archive or available from ZUMA Press.